A Stonehenge on Mars? Strange rock formation resembles the iconic British monument found on the surface of the red planet. Meet ‘Marshenge’, a mysterious rock formation that has been spotted on the surface of the red planet. The mysterious formation rests on a mound that rises from the ground and clearly seems to be surrounded by a ditch. I think we can agree that it is very unlikely that what we are seeing here is the result of Pareidolia. But is it possible that we are looking at an ancient monument on Mars? This mysterious rock formation clearly resembles the well-known Stonehenge in Britain and is very unlikely to be the result of Mars’ Mother Nature. The mysterious rock formation on Mars is unique in the area it was photographed, and as you will see in the original image, there is nothing nearby that resembles in any way the mysterious rocks formed in a circle. Is It possible that we are looking at the remains of an ancient monument on Mars or an ancient construction? Does this indicate that ancient civilizations did inhabit the red planet hundreds of thousands of years ago as some suggest? This image provided by HiRISE is one of the most controversial photographs from Mars that we have seen in a while. The rock formation was detected thanks to the High Resolution Imaging Science Experiment, a camera on board the Mars Reconnaissance Orbiter. The first to identify the mysterious features on the surface of Mars was a group on Facebook called Journey to the Surface of Mars. People who have looked at the image and compared it to an aerial view of Stonehenge believe that these two have certain similarities that cannot be overlooked. A close-up of the mysterious rock formation. 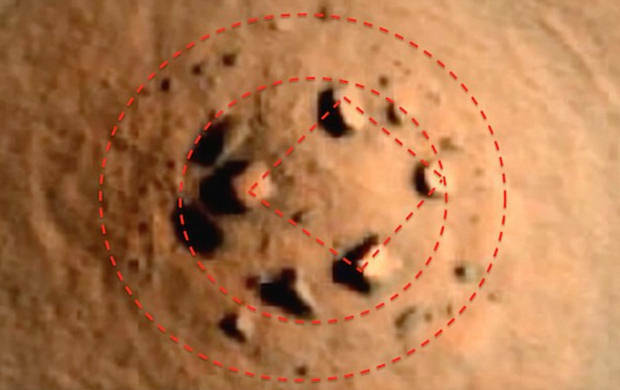 The MArtian Stonehenge? Check out there Raw file from HiRISE here. Skeptics on the other hand believe there is nothing special about the image and that the blocks of stone, photographed on the surface of the red planet have no similarities whatsoever to those found in Britain. Skeptics claim that these stone circles can be formed as a result of natural processes that also take place here on Earth. Permafrost can cause sediments to rotate and separate which can make blocks of stone move and position them in circles or polygons resulting in formations like we see here.What do you think about the new discovery? Is it possible that this is in face an artificial structure? Or are we looking at the result of Mother Nature on Mars? Let us know what you think.